It's here, and it's official.....this will be the last ever issue of Night Sky magazine. With the first issue from May/June 2004, Night Sky gave experienced amateur astronomers lots of new ideas for easier ways to help explain myriad things in the night sky to anyone just entering this hobby we love so much. I know of a few people who actually started subscriptions to Night Sky, our own AOAS founding member Dale Hall among them. Even I was quickly taken in by the way this new astronomy magazine did its job, getting the rawest of novices outside to see things never seen before. Yet, the subscriptions for Night Sky never really did catch on. As a letter inside the front pages of this last issue announces, "ultimately we couldn't attract nearly enough [beginning astronomer] like-minded people to sustain the effort profitably. I'm sorry to tell you that this issue of Night Sky will be the last." Kelly Beatty, Editor. I hate to see it go so soon, but I understand why they're doing it. You can't keep pouring more and more money into any effort that never reaches a level of at least breaking even. Now all we have are our back-issues to help us with invaluable ways to explain the abstract, the mundane, and the sublime, to all our new recruits to astronomy. We MUST hold on to these past issues for that very reason. Night Sky will live on, even if its as dead as a door nail. 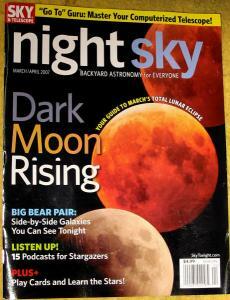 The final issue of Night Sky magazine. In only three short years the magazine was becoming a welcome aid to many newbie amateur astronomers. But low subscription levels were slowly doing it in. Now we'll make sure that we keep a valuable resource available to our members by creating as many complete sets of every issue that we possibly can. I heard it through the Night Sky Network with an email about 3 months ago. Night Sky was closing up shop and doomed to fade away like a dimming supernova. I had become a real fan and I eagerly awaited the next issue. As members of the Night Sky Network, we were part of a campaign to help put Night Sky into the hands of as many visiting individuals as we could whenever we had an observing event, school visit, or a club meeting. They allowed us up to 40 issues each printing for free to give away at those opportunities, and I'll really miss that, too. I made sure that I started keeping one copy of every issue to start a collection that we'd be able to refer to for as long as the paper held together. That way, I reasoned, we'd always have those great tips found in the magazine to be made available to anyone that I thought might benefit from them. Now that its finally official, I want to ask everyone reading this to do one of two things...1) send or bring me all the past issues of Night Sky magazine as you have, or, 2) donate the issues you have to your nearest, or favorite astronomy club in your area. Why, you ask? Well, I'd at least hope that everyone would recognize how the past issues are able to instruct and inspire newcomers to our hobby in learning so much from such a great resource. What I want to do for our AOAS library is to make up as many complete sets of the magazine as I can assemble, put these sets in individual magazine cases, and make them available to every paid member of AOAS to use whenever they ask for them. In order to accomplish this, I want to ask EVERYONE who has back issues of Night Sky magazine to find a way to get them to me. You can bring them to me at our next observing event (Feb 16th at Hackett), club meeting (set for March 2nd at UAFS MS-UC room 211 at 7pm) or at any other function or outing where you might find me. If you want to send them via snail-mail, it's a little more expensive than I'd want to spend just to donate some magazines to us, but that's your choice. I really liked this magazine and my Mom subscribed to it. I'll talk to her about her back issues.